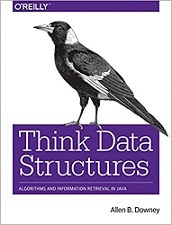 Data structures and algorithms are among the most important inventions of the last 50 years, and they are fundamental tools software engineers need to know. But in the author's opinion, most of the books on these topics are too theoretical, too big, and too 'bottom up'. If you’re a student studying computer science or a software developer preparing for technical interviews, this practical book will help you learn and review some of the most important ideas in software engineering - data structures and algorithms - in a way that's clearer, more concise, and more engaging than other materials. By emphasizing practical knowledge and skills over theory, author Allen Downey shows you how to use data structures to implement efficient algorithms, and then analyze and measure their performance. You’ll explore the important classes in the Java collections framework (JCF), how they're implemented, and how they're expected to perform. Each chapter presents hands-on exercises supported by test code online. Allen B. Downey is a Professor of Computer Science at Olin College of Engineering. He has taught at Wellesley College, Colby College, and U.C. Berkeley. He has a Ph.D. in Computer Science from U.C. Berkeley and Master’s and Bachelor’s degrees from MIT.